How many times have you seen beautiful chair covers, but stopped short at the price? Even just covering my 6 dining room chairs would cost a pretty penny when the covers cost $20-30 a piece. And anyone who has thrown a semi-formal party or planned a wedding knows that chair covers are a huge cost. 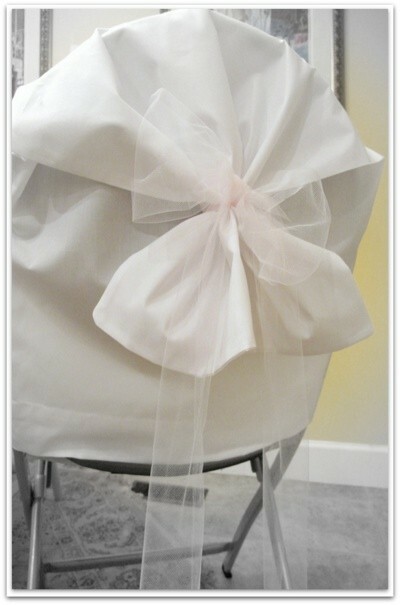 Here’s a clever way to have those lovely chair covers and save a bundle. Pillowcases. Use white standard pillowcases and tie them back with tulle. Slip the pillowcase over the back about 2/3 of the way down. Fold over the top of the case, creating pleats as you go. Tie with tulle or wide ribbon. Fluff the end to make it pretty. The pillowcases can be bought in bulk at places like Sam’s Club, saving you TONS of money. The possibilities are endless by simply changing the style and color of the ribbon tie-backs. These fit perfectly over the back of your average-sized folding chair rentals. chair, covers, Party, pillowcases, wedding. Bookmark.